Do you recall, not so long ago, all those property programmes on TV banging on about how great decking is? No, neither do I really, but I assume they must have done, because one day in mid-2008 I realised that every garden I went in seemed to have planks of wood where grass had once been. When we bought our house in 2010 the decking craze had faded a bit. But, because no-one had any money anymore *shakes fist at Lehman Brothers et al*, all the gardens which had been covered in nice wood were now covered in two year old, neglected wood. Our new home had been treated to a liberal smattering of decking, roughly 70% of the back garden was covered in it. Aesthetically speaking, the decking was okay. It did have a thin film of incredibly slippery green stuff on it, as a result of the previous owners never cleaning it, but as long as all you wanted to do was look at the garden from inside, it was okay. Cutting the lawn took moments, as there was only roughly four square feet of it. Structurally, the decking was not so good. It was flagged up by the surveyor, as it had been built too high, which meant a risk of damp creeping up past the damp proof course of the house itself. It also had a bit of a rickety "DIY" feel to it. One day, soon after we moved in, water started coming through the kitchen floor, which put something of a dampener (sorry) on our moods. We didn't know where the water was coming from, and the decking didn't have an access panel to the drain we assumed would be underneath it. If that drain was blocked, causing our kitchen to do an impression of a paddling pool, it needed sorting. The decking had to go. The occasions where I feel like a manly man are few and far between. The day that I started taking up the decking was one of them. A hammer, a saw, not one but TWO crowbars were my weapons of choice. The decking didn't go without a fight. Despite it's less than sturdy appearance, I soon discovered that whoever had built it was a firm believer in not using one nail if there was the option to use six. Reinforcements were drafted in: Mrs L, my younger brother, my mum and dad, all pitching in to purge the garden of the wooden blight. Slowly but surely, we were winning. At the very end of the day, I let my guard down. I lost my respect for our adversary and trod on a six inch nail. I didn't have any body piercings before that day, and I had never suspected that my first one would be right through my foot. One tetanus jab later and the last few pieces of wood were transported to the tip. Hooray. Sadly, the state of our garden beneath the decking looked like an homage to London during the blitz. Which is pretty much how it remained until last Tuesday, when a nice man came and rotovated it, turfed it, and gave us a nice, Cam friendly garden. The house I grew up in had a big garden at the front, a small garden at the rear, and a disused quarry which me and my siblings used as our personal adventure playground. I can't imagine I'll ever be able to offer Cam a similar facility, but we do now have some usable outside space for him to run around in and get muddy. This pleases me enormously. I love the outdoors, and the availability of green space for Cam to use is important to me. I could probably write a post every single day about something a politician has said which has caused the urine in my bladder to approach boiling point. When I see what our elected officials are spouting the air in my vicinity adopts the vivid purple hue of a two day old bruise, as the blue from my swearing mixes with the crimson of my rage. I don’t write those posts every day, because I don’t have the time. Or the inclination. Or the purpose. Ah yes. Purpose. It’s not only me who lacks it. According to Childcare Minister Elizabeth Truss the nurseries of our nation are riddled with purposeless toddlers. Apparently, our approach needs to be more closely aligned with the French (yes, really, a Tory politician who thinks our continental cousins have something better than us). Our nurseries are “chaotic settings, where children are running around”. How DARE THEY? Children, some as old as FOUR, with not even a hint of a schedule. Which means, of course, that by the time they get to primary school they are not prepared to sit down and listen to a teacher. I’m sorry (I’m not), but what utter, utter tripe this is. First off, let me say this: I want my child, and the children of others, to grow up in a world where they are allowed to be children. Actually, allowed? No. Encouraged. Being a child is amazing. Playing is amazing. All the fantastical things we believe as children which are driven out of us before our tenth birthday, Father Christmas, the Tooth Fairy, and all their friends, are great. Not having a care in the world is lovely, and it should last as long as possible. Seriously, adults, just because we’ve signed up to a world model which requires constant growth which we have trouble sustaining, doesn’t mean we ought to be grooming our children to be part of it from ever earlier ages. Looks pretty purposeful there, doesn’t he? Sure, the purpose he’s displaying might just be to remove as many tissues as possible from that box, but he seems pretty sure of that intention, right? Cam’s not even two. He’s only just one. A purposeful one year old. Like all other one and two year olds, his purpose is simple: learn through experience. Play. Discover. Explore. Interact with the world around him. Be a baby. Be a toddler. Be a child. Let the adults worry about having a purpose because, in all honesty, most of them probably haven’t worked theirs out yet. Just over a year ago, when Cam arrived into our lives, we accepted that Things Would Change. Once there is a tiny additional human occupying your spare room, opportunities to do the things which used to be the things that you did to relax and enjoy yourself become a bit thinner on the ground. I have been tremendously lucky; Mrs L has been extremely accommodating of my need to go out and play a stupid game where ten grown adults throw a ball through a hoop for forty minutes. Basketball generally takes place during times when Cam would (and, thankfully, is) usually sleep, so I've never felt like I'm leaving Mrs L to deal with the baby while I go out and enjoy myself. The same can not be said for my other pre-baby hobby: cycling. It is fair to say that I have missed cycling. Time spent on two wheels since Cam arrived has been minimal. Which is fine, obviously. I love the time I spend with Cam and I wouldn't change it for anything. Unless I could combine cycling and Cam. I don't mean I want to create a cyborg bicycle child. I just want a way to get out on the bike without having to leave the family behind when I do. Which is why, pretty much as soon as he was able to hold his head up, I started thinking about bike seats for Cam. 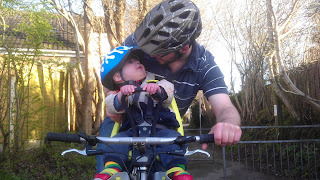 There's not an enormous amount of information out there about cycling with a baby, but there is some. I looked at www.cyclesprog.co.uk and www.sustrans.org.uk. Most importantly, I got some first hand information and recommendations from Cathy Bussey's blog. All of which led me to thinking that Cam's first birthday would be a good time to start seriously considering cycling with him. Fitting it was very simple, a five minute job which required only a couple of allen keys (Yepp even include one in the box, although it is made of metal which is about as durable as a mild cheddar). The mount goes between the stem and the headset if you have a "traditional" threaded headset. If you have a threadless headset, you'll be needing an additional adaptor before you can fit the seat. This, to me, seems a bit backwards. Most bikes now come with a threadless headset, it would probably be more sensible to include the adaptor as standard. I'm not complaining though, since my ancient Kona has the old style headset. Once it was fitted, I looked at the bike and thought "there's no room left for me". Luckily, this is a bit of an optical illusion (apparently I don't occupy as much space as I thought). Once on the bike I was close enough to Cam to feel like I was giving him a cuddle, without him being in my way, or me being in his. 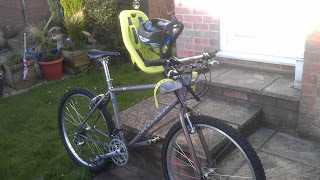 My knees do brush the back of the seat a bit, but a bit of saddle adjustment will hopefully sort that out. The first few moments of riding feel a bit weird; all of your baby's weight, plus that of the seat, is on the bit of the bike you use to steer. You know how it feels if you put a carrier bag with some heavy shopping in on the end of your handlebars? It's a lesser version of that. Once I'd been riding for five minutes I didn't even notice it. Cam seemed to enjoy his first ever bike ride, we only went for a local ride, but he got to see the world from a different point of view (it's nice and open compared to his buggy) and didn't cry or scream once. I came back with a massive smile on my face and a feeling that we have opened a door to all sorts of potential family fun. Getting out of the house with a baby can be a bit of a chore. Everything takes AGES with a little person in tow. Buggies are very short range instruments, and starting the car to drive a mile seems incredibly wasteful to me. 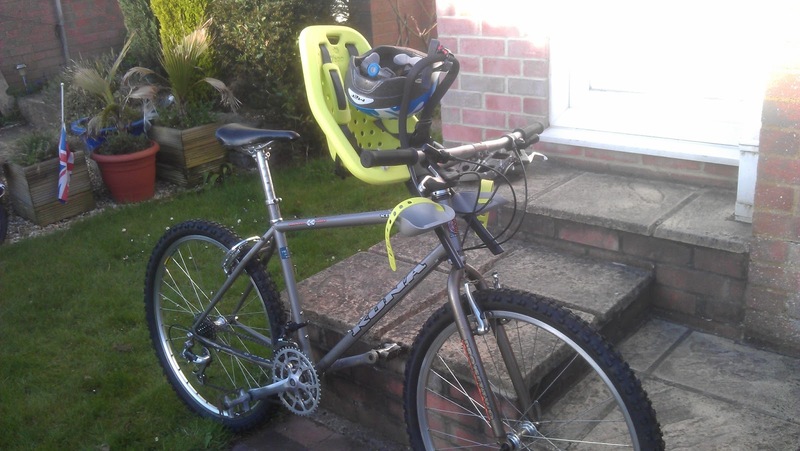 A bike seat occupies a lovely middle ground, it offers much of the freedom a car does, but without the running costs. It also means I will have more chances to do a thing I enjoy, and involve my baby in it as well. Hear that rumble? It's the sound of a bandwagon, which I'm about to jump on. I've been deliberately staying away from this up until now, because I've been hearing all sorts of impassioned stuff. I didn't really feel I had anything to add when it comes to, you know, HER. See, I'm a bit too young to remember what life was like when Margaret Thatcher was Prime Minister. She was resident at Number 10 for the first eight years of my life, years where I was definitely more interested in the exploits of Optimus Prime than those of the Prime Minister. Of course, as luck would have it, I lived in the South West of England, so my family wasn't being directly affected by things like the closure of coal mines. My dad was made redundant during her tenure, but not as a result of anything she did. Would I have understood or cared even if he had been? So I wasn't old enough to have an opinion of the Iron Lady at the time she was exerting her will upon the nation, nor was I in one of the geographical areas most impacted by her policies. According to many, this means I'm not allowed an opinion on her now. One of my ex-girlfriends lived in a shared house at university. Among her housemates was a young woman who would only watch films, or read books, which were set within her lifetime. Incredibly, anything prior to this was considered completely irrelevant to her. That's weird, right? Really weird? I hold an opinion on Margaret Thatcher because she was important. She did big things. Changed the way a lot of people think. Wreaked havoc on whole swathes of the country and had no interest in hearing people's objections. Probably the most divisive political leader in living memory, and some people think we shouldn't be talking about her. Except that's not what it is, is it? The people who are resisting the negative comments about Thatcher are the people who believe that she saved the nation (and, for the record, I think anyone who sees no bad in her actions is a fool, but I also think her actions came at a time when something needed to be done, and big changes are never positive for everybody). These are the people who want to hear only praise. Probably, in large part, they are the people who did well during Thatcher's time in government. Now, I have no desire to go to a party in celebration of anyone's death, that's a bit macabre for my tastes. Do the people staging these things think that somehow Lady T still had her hand on the steering wheel all these years? That the unwell old lady portrayed by Meryl Streep in The Iron Lady was a cunning disguise? Maybe don't put your energy into celebrating Thatcher's death, put it into fighting against her ideological offspring's current style of government. Or, maybe, have a death party, I don't really mind. I also wouldn't mind if you were celebrating the death of someone whose politics align more closely with mine. It might be bad taste, but I don't find it offensive. If Margaret Thatcher is now in some other plane of existence, watching down (or up…) on us I don't think she'd be offended. I might be too young to remember, but apparently she was quite a strong character. PS - The alleged cost of the funeral though? That's taking the piss, especially with the "we're not telling you how much it cost until it's happened" line which the government are taking. No-one's funeral should cost that much. Silly.